Local apprentice Zac Shields (left) with this year’s judges and previous winners of the Central Otago NZCB Apprentice Challenge, Mark Templeton (2016/17 winner) and Peter Burgess (2018 winner). A Wanaka apprentice was named Central Otago’s top building apprentice at the NZCB Apprentice Challenge on April 6. Zac Shields claimed victory in competition against three other skilled apprentices. This year’s Apprentice Challenge received a large number of entries nationwide, including a record number of entries from female apprentices. Each apprentice was given detailed construction plans and eight hours to create a park seat which was then assessed by a panel of expert judges on workmanship, measuring, cutting and assembly. Shields, 21, who is in the third year of his building apprenticeship with Dunlop Builders, received the highest overall score. The park seats crafted by apprentices will be donated to their respective regional Cancer Society divisions. 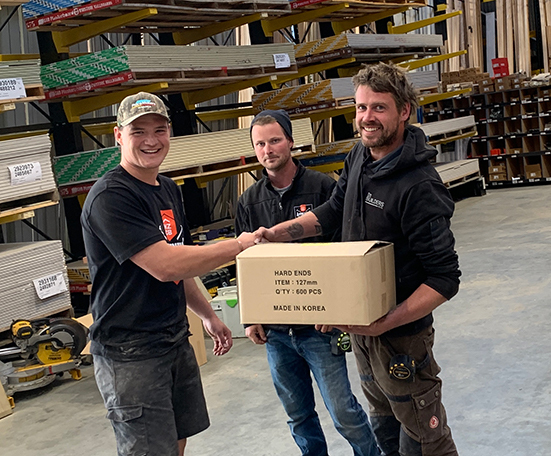 As the regional winner, Smith takes home a range of trade tools courtesy of sponsor ITM, and will move forward to represent Central Otago at the NZCB Apprentice Challenge Final. NZCB chief executive Grant Florence was impressed with the skill, talent, and passion the carpentry apprentices demonstrated, saying it was a testament to their dedication, employer support, and the comprehensive training provided by the Industry Training Association Building (ITAB) scheme. “The future of New Zealand’s building industry is dependent on a robust pipeline of top-quality apprentices. Fostering and encouraging young talent is a responsibility NZCB takes seriously,” Florence said. Shield will go up against 19 other regional winners from around the country to compete for the Ken Read Memorial Trophy and $50,000 in prizes at the final which takes place at the NZCB Annual Conference in Christchurch on June 14-15.